I've had an industrial Singer straight stitch garment machine for years, and it sits in my living room and is used daily. But I can't quilt on it. 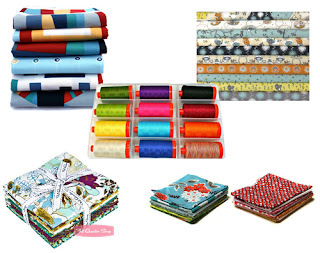 I also have a Bernina Artista 730 which I DO quilt on, but only small stuff. um. I don't do a lot of small stuff. I have 3?4? queen or bigger tops just waiting for quilting. So, for the past several months, I've been researching sewing/quilting machines, and trying to find a solution. Most people seem to love their Janine Horizons, but I LOVE front or side loading bobbins, not drop in. Like, its a deal breaker for me. Then my super talented friend Janice of Better Off Thread bought a Juki TL2000, and my mind was blown. Absolutely everything I want at a price I can (almost) afford. I ordered it yesterday (I got the 2010Q, floor model from Sewing Machines Plus), and because they're only like a hundred miles away, even with (free) ground shipping it arrived today! Sooo, it was really hot, and I was knitting a lot, and I wound up having to take my knitting to the hospital, and finishing it there, while holding this little dude. I'm MADLY in love with my micro-sashing. MADLY.